Virtual Private Networks (VPNs) were created with the intent of bridging geographically separated Local Area Networks (LANs) over a shared network, like the Internet. This is useful to say, connect one company office in New York to another one in Sydney. The NY and Sydney office share the network among themselves, while the data between the two offices is unreadable in transit because it is encrypted. The two LANs form a protected tunnel over the internet. Today, this property is exploited in a different manner. 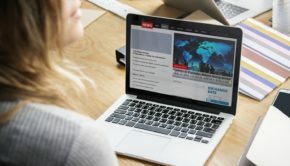 Since VPNs can connect you to a remote network, they are now used widely to bypass network restrictions, censorships and to protect privacy by making the end user appear to be connected from a different location. What happens is that, instead of the usual use case of bridging two remote networks, it registers your device (PC, phone, tablet, etc.) as a part of the network operated by the VPN provider. Since you are technically part of a network where the VPN server is located, your internet traffic appears to leave and enter at that location. Also because you are connected via a tunnel to the VPN server, your immediate network cannot read what you are sending or receiving, thus ensuring privacy for you. This has led to the boom of VPN operators who market their services to the end-user as a privacy protection tool. 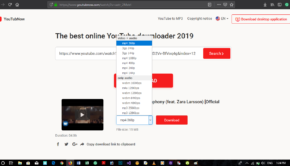 Configuring VPNs is usually a tedious task; one needs to import profiles and configure connection settings. 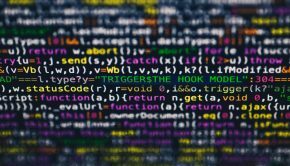 But VPN operators whose sole motive is to bypass restrictions, geoblocking and ensuring privacy, have created easy to use apps for the new-to-average user to achieve their goals easily. Today, I’m going to review a VPN app named Rocket VPN, and share my experiences with you. I hope you like reading as much as I enjoyed writing this. 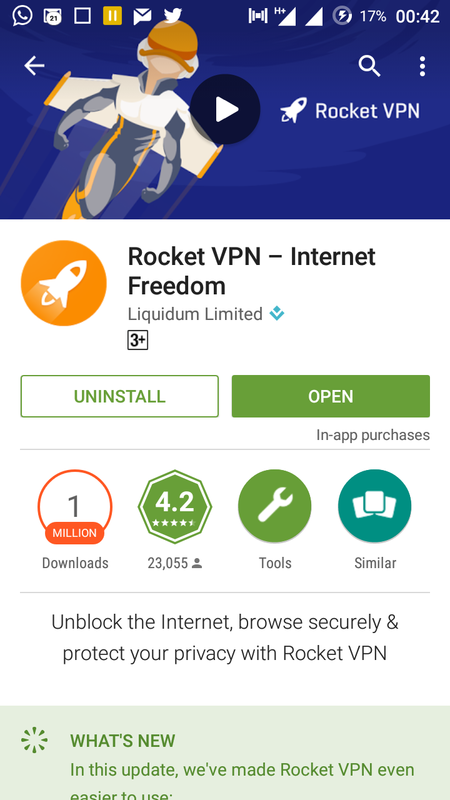 Rocket VPN, developed by Liquidum Limited, is available for free download from the Play Store. Getting started with it is an absolute no-brainer. 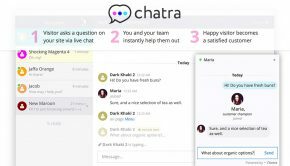 The app is developed keeping new and non-technical users in mind. Also, it follows the material design guidelines and has an intuitive UX so much so that I will go to the extent of calling it an absolute beauty by the looks alone. 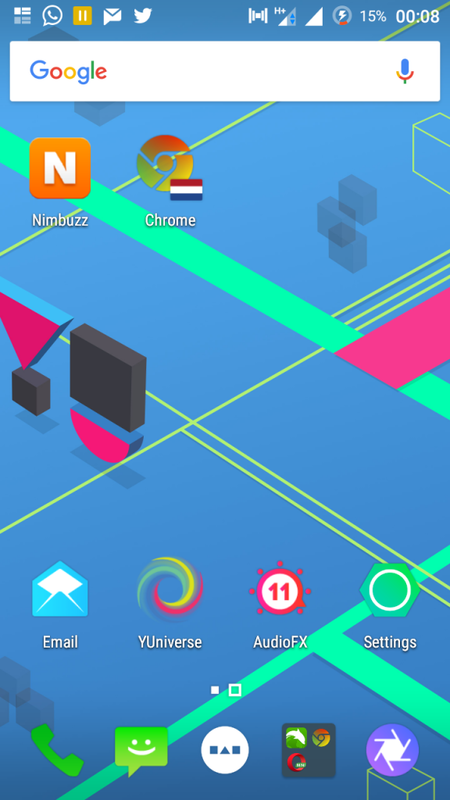 The home screen shows your current connection status and the nearest VPN location you can connect to in one tap. Tapping the CONNECT button gets you connected to the VPN location that is displayed above it. You can also change the location by tapping the location name. Scrolling down, there is a ‘Rocket Browser’, which is a stripped down incognito browser window that keeps no cookies. However, it does store a history of visited sites and favourites, so one should take care of that. One can simply visit a site privately by typing a URL in the field, then pressing enter. One can also choose the location to browse from by the dropdown country flag box. Below that is an ‘Unblock Apps’ option, that allows you to specify different locations to connect from for different apps, for e.g. 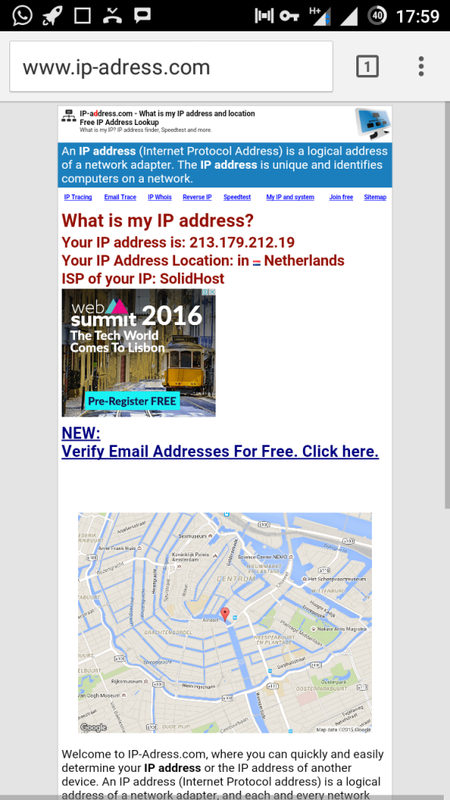 connecting to Netherlands for Chrome and London for WhatsApp. This is especially handy in unblocking geoblocks: you wish to connect to the US for Netflix and the UK for BBC iPlayer. You can also create a shortcut on the home screen for an app. 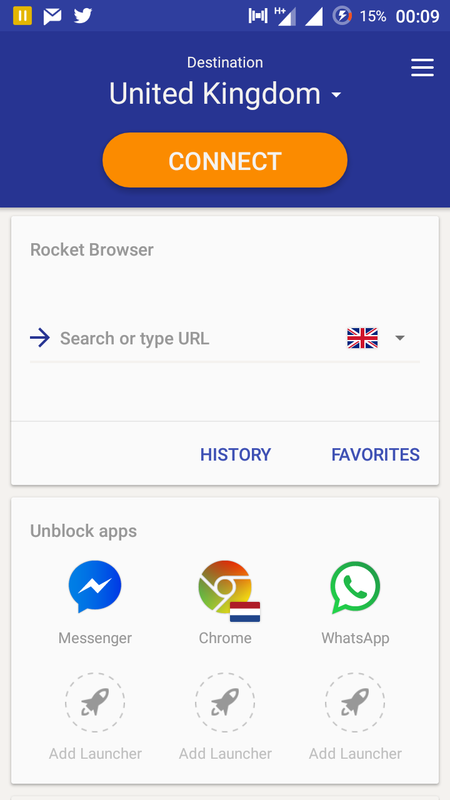 Tapping the shortcut automatically connects the app via the location specified in Rocket VPN to the Internet. Handy, isn’t it? Next comes the ‘Usage’ section that shows your monthly usage. 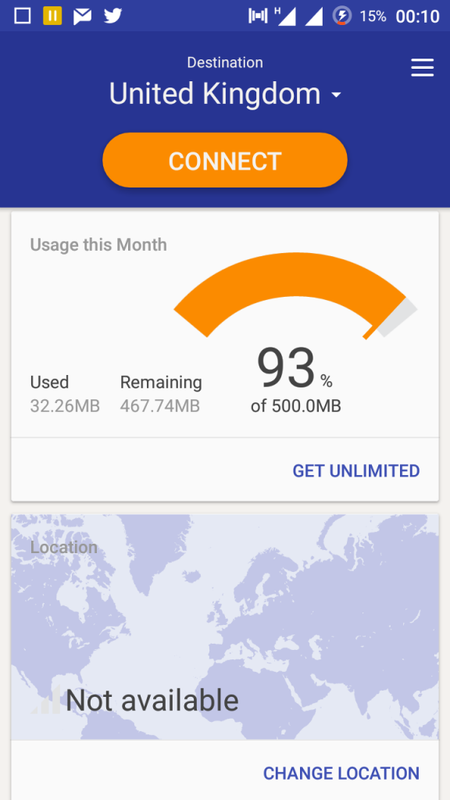 Free users get 500 MB of data transfer every month. 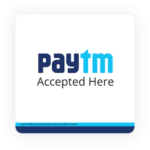 For more data, one can buy the unlimited plan for approximately US$4 (INR 281.18) per month. Discounts are available for longer terms. 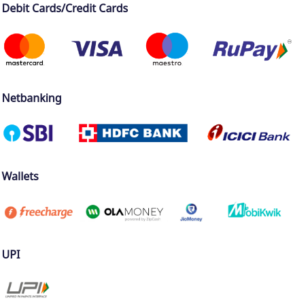 The terms and conditions state that one can use an unlimited plan on upto 5 devices by a single user. Not bad. 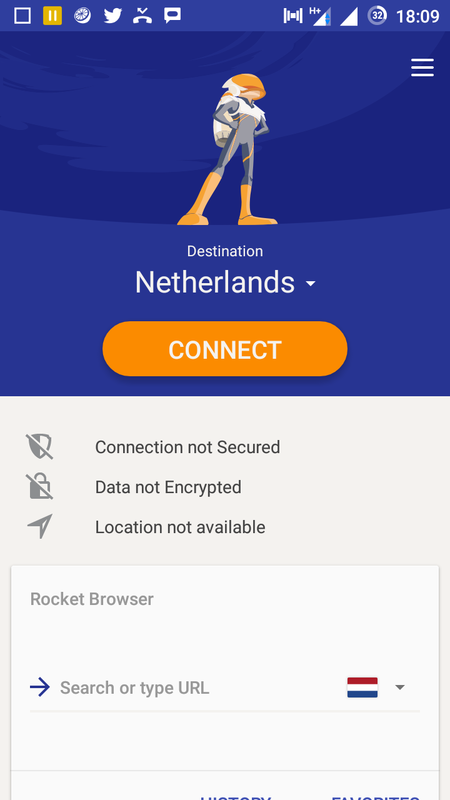 Finally comes the ‘Location’ section which displays the entire list of locations available in Rocket VPN, and their current reachability status. If you wish to force a specific location for the VPN app, you can do so here. The 3-dotted menu has options to buy more time and log in as an existing user. 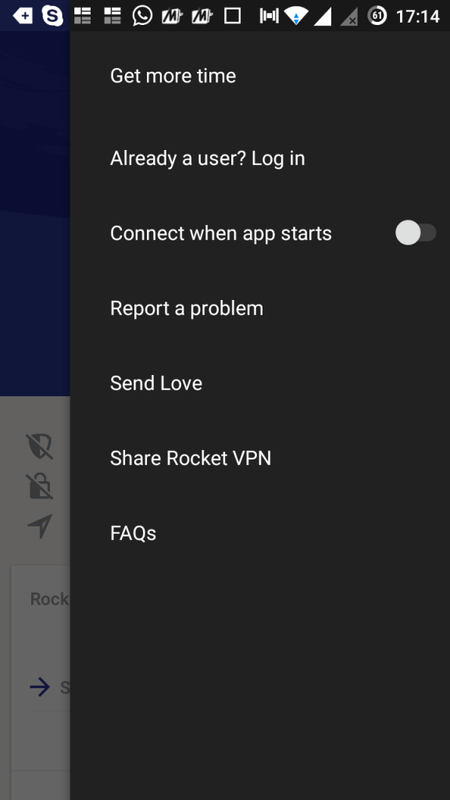 There is also an auto-start toggle that fires up the VPN connection when the app starts. The other options are for reporting problems, sending feedback, sharing the app with other people and a FAQ list. The app has more than enough features for the everyday mobile user to protect his/her privacy. However, being an everyday VPN user, I miss two important features. One is that, if I choose to buy the paid subscription, I wish to use it on my PC, laptop or Mac as well. The second is that, I do not have the option to set the HTTP or SOCKS proxy if I use one. This comes as a deal-breaker for people in restrictive networks like workplaces and educational institutions where the only way to access the internet is via a proxy. I’m not sure if the developers forgot to put it in or overlooked it for the sake of simplicity. I hope they take it as a critical feedback and improve their app. If the stock OpenVPN for Android app supports proxies, then why not any other app? Since I surf the web from a restrictive university network, I could not test Rocket VPN from the LAN due to the lack of proxy support. 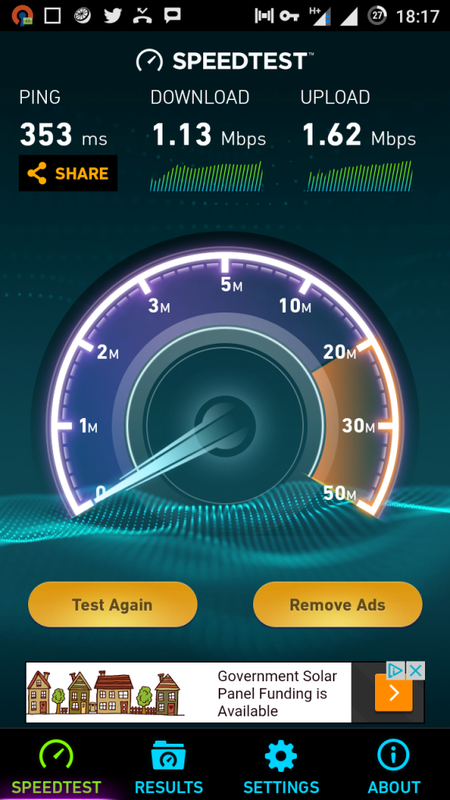 So, I tested it over a 3G connection with the Speedtest app and compared the performance with another VPN service provider (UnoTelly) and without a VPN. The connection without any VPN reaches a throughput of 4.73 Mbps downlink and 0.81 Mbps uplink with 119 ms ping. With Rocket VPN, I get 1.12 Mbps downlink and 0.94 Mbps uplink with 477 ms ping via Netherlands. With UnoTelly, I get 1.13 Mbps downlink and 1.62 Mbps uplink with 353 ms ping via Netherlands. 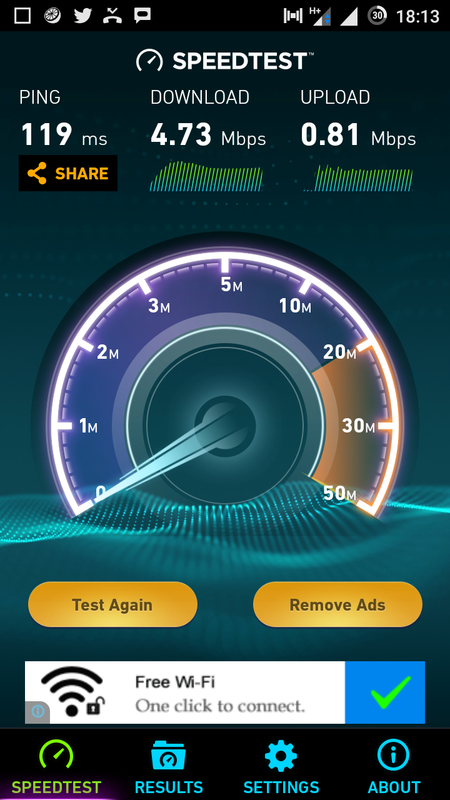 On repeated tests, UnoTelly is marginally faster than Rocket VPN. However, since the connection is wireless and transient issues happen, due to the manner it is routed, I’d like to provide both of them the benefit of doubt. 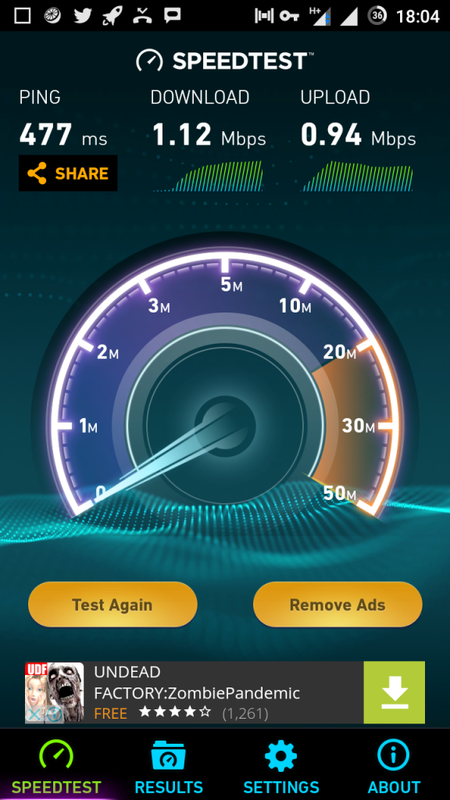 Real-life download tests show that Rocket VPN is marginally faster than UnoTelly. Now, again it all depends on the site you’re trying to access, plus the quality of your 3G connection. I’d like to believe that Rocket VPN’s performance is as good as any industry leading VPN service provider. 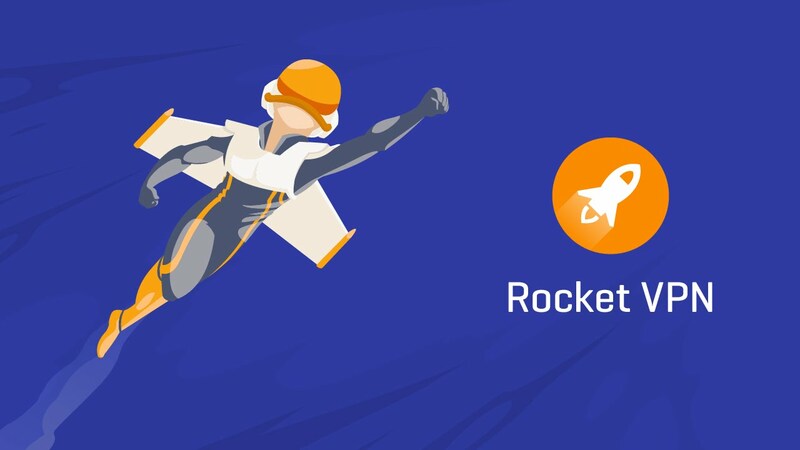 Rocket VPN is a great pro-privacy app for the average Android user. Anyone who knows how to operate a phone, including your grandparents, can get started right away with the app, given the great UX. There are a lot of essential features like a private browser and per-app location setting to make your internet access joyful. 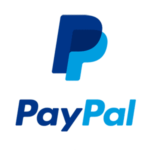 The service is priced well and is performant as any good VPN service provider. Advanced users might find the lack of PC/Mac/laptop access and proxy support rather disturbing. But given that the service is geared towards smartphone users, it lives up to its expectations very well.